You are here: Home / Scam Review / Does Google AdWords‎ Help India Online Jobs Scammer? No doubts Google Adwords is the best solution for online Advertise. Anyone can attract customers with the products that they’re searching for! But here in India there is big scam running in the name of Online Jobs and Work from Home Jobs. Almost 2000 fake websites scam Indian innocent people. Each day 100 of people’s losing money on such fake online work from home jobs. Here in scamdesk.com we always find those scammer’s website and spread awareness to the Indian people. But for last couple of month we notice that India scammer misusing Google Adwords online Advertise service and scam more and more people by their Online Jobs Trap. Recommend: Online Jobs scam using Google adwords – Gaining an Unfair Advantage ! India people always searching for online passive income on Google. Every day lots of student, housewife, unemployed search for Online jobs, part time Jobs or work from home jobs. Some scammer from India uses this opportunity by trap people in fake online jobs. The registration fees amount is non-refundable. The work will be too herd and time bounding. 99% people failed to fulfil the work target. Now if any one completes their work properly then the fake guys black listed their number and never may any payment to reply to emails. Now the problem is getting top on Google search is too hard and takes a lot of time and concentration. So the Scammer Sing up in Google Adwords and bit on “Work from Home jobs” , “Data Entry jobs” , “part time jobs” , “SMS Sending jobs” keywords and show their website in the top of Google Search. Usually India people hit on those scam ads and Google redirect them into a Online Jobs scammer lading page. Almost 1 of 10 people failed to detect those scams website and sing up. After sing up people pay the registration amount and get frustrated due to money loss. People try to make complaints against them in consumer forums or scam adviser website but as soon as the complaints start appearing into Google search the summer start a new Online jobs website and again start online advertising campaigning on Google adwords. 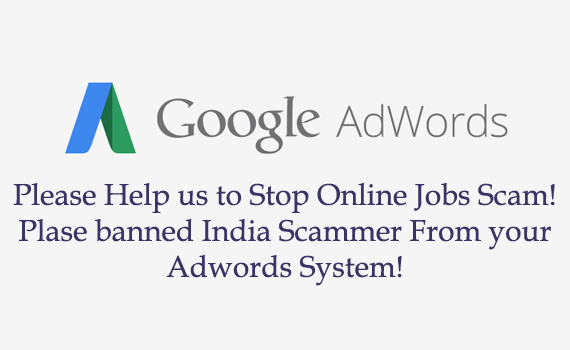 Why India Online Jobs Scammer Love to use Google Adwords ? This is really a big misuse of Google adwords. It’s like Google Indirectly help those scammer. We all know Online jobs, work from home jobs are full of scam so , why Google still quite on this issue? Why this is no verification on website content and legitimate? Google earn millions of money from Google adwords so in the interest of India people safety why not Google banned those sensitive keyword from their adwords campaigning tools? Its might be a very small business losses for Google but it’s really save India innocent people hard earning money. How we can stop such a fake online jobs websites? In future Google may block those scammer from their adwords, but still now we India have to more aggressive on detecting online scam. First of all avoid any ads on Google search base on Online jobs or work from home. I have never seen anyone to earn money from those fake online jobs website. So stop thing about big earning by doing online data entry jobs or online PPC jobs. Instead of wasting money and time start a blog on Google BlogSpot and earn money online. If you still confined with any online jobs website then, before making any payment see our tips to detect online jobs scam. Or you can ask any online jobs related question into our forum and we will help you to review any website scam or real. I really love Google for their amazing servers, most of the service and free to us thanks to google, Also Google allow me to build my career online. For the lost 8 month I have successful earn money from Google AdSense but I was sad as some of India scammer taking advantage of Google adwords to scam our India brothers and sister. So if Google adword take a review on my point and help our India people from online jobs scammer then we all Indian are pleased to Google team. Recently I got a email from one of our reader that Google never allow any scam ads into adwords system. Google always verify their ads on after a random time. May be India scammer use some trick to avoid Google adwords verification and keep running fake online work from home jobs ads. So my request to Google adwords team please review it for our India people. Let me know if you have any more idea to stop online jobs Scammer and clean Google adwords from fake ads.